EAD & Associates, LLC carried out an exercise with emergency managers in American Samoa. 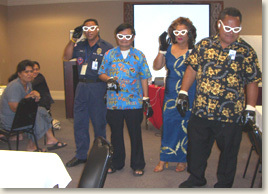 In this photo, four managers wear special glasses that simulate different visual disabilities to experience what it is like to navigate a reception center or follow recovery instructions with a disability. EAD & Associates, LLC works with a client base that includes public and private agencies, organizations, companies, academic institutions, not-for-profits, and acts in an advisory capacity to many of the largest federal departments and policy administrations. Involvement ranges from working on small, discrete parts of plans to creating broad-reaching protocol solutions. The company's on-going activity within both the fields of emergency management and functional and access needs planning assures exposure to and compliance with the latest changes in codes and standards. As the field of emergency management is dynamic and ever-changing, EAD & Associates, LLC remains fiscally responsive to its clients and provides access to the most appropriate subject matter experts by maintaining strong teaming arrangements with other consultancies following industry practices. "EAD and Associates is our 'go to' partner for all of Kroll's special needs planning projects. Elizabeth and her staff are knowledgeable, creative and passionate, and their professionalism and dedication always makes it a pleasure to work with them. EAD and Associates is the 'gold-standard' among special needs emergency management consultants." 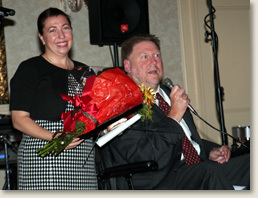 Elizabeth Davis, founder of EAD & Associates, receiving the Progressive Center for Independent Living's Leadership Award. Presenting the award is PCIL's Executive Director Scott Elliott. EAD & Associates, LLC's association with firms such as AG Consulting, Booz Allen Hamilton, CLG Consulting, CRA, Dewberry & Davis, ICF International, James Lee Witt Associates, JJM & Associates, SerVision, Strategic Emergency Group, and Team EMS to list a few, provides clients with resource assets in the general areas of fire and life safety, security, code compliance and business continuity both nationally and internationally as well as access to the latest information, technology and equipment available. EAD & Associates, LLC is the recognized expert when a convergence of emergency management and special needs issues is called for. As such, EAD & Associates, LLC maintains management and oversight of all aspects of projects pertaining to this specialized topic area no matter the other teaming partners. As a boutique firm addressing a very specific area of special needs and more generally human services in the field and practice of emergency management, our firm mission and philosophy support an equal split annually of for profit work coupled with pro bono hours to demonstrate our commitment as professionals to our areas of expertise. As such, much of the work we are involved with has a national impact and depth while the exposure is not noted by revenue or accounting alone. We remain true to this commitment and it has resulted in “informal” advising to most of the federal agencies, research efforts, and has even resulted in operational and logistics support in areas such as special needs sheltering, immediate demographic analysis and policy drafting during emergencies. "Elizabeth Davis is a one person tour de force in organizing and directing an outstanding event."